Meech Creek Valley covered bridge (1932) in Chelsea, Québec, Canada (Gatineau Park). 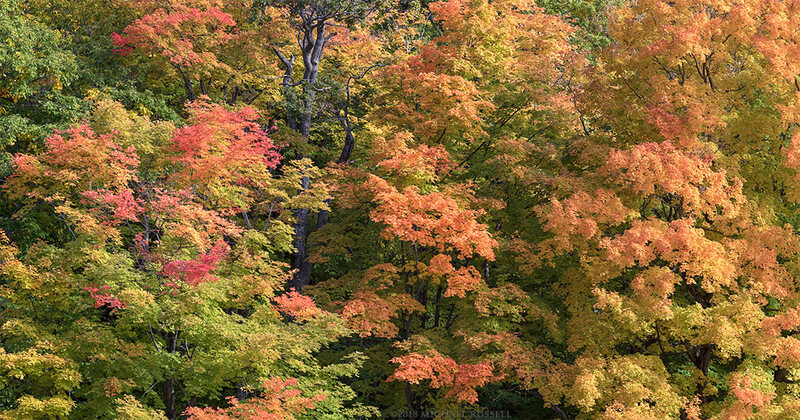 In my last post I showed some fall foliage I’d seen at Gatineau Park in Québec. Those images were from the southern part of Gatineau Park, so I thought with this post I’d show some of the scenes I found in the northeastern parts of the park. The fall foliage color wasn’t quite as pronounced here, but was still nice and as always adds a bit of color to a photograph that wouldn’t be quite the same with green leaves. 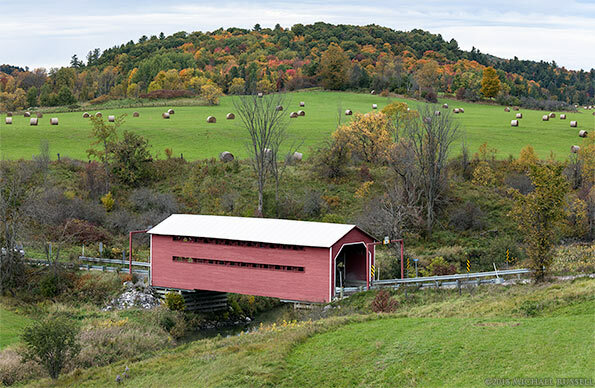 This first photograph is the Meech Creek covered bridge in Chelsea, Québec, just within the eastern border of the park. Unlike a lot of the other covered bridges I photographed during my week in the east, this bridge doesn’t appear to have an official name and doesn’t have the year it was built posted on it. There is an information sign further up the road which indicated this bridge was built in 1932 as a Depression era make work project, but while it calls it the “Meech Creek Covered Bridge” it doesn’t appear to be as official a name as that given to some other covered bridges. This old gravel road (Chemin Cafferty) is near the eastern edge of the park (near Autoroute 5) and eventually joins up with a trail called Cross Loop which heads to Lac Carman in Gatineau Park. 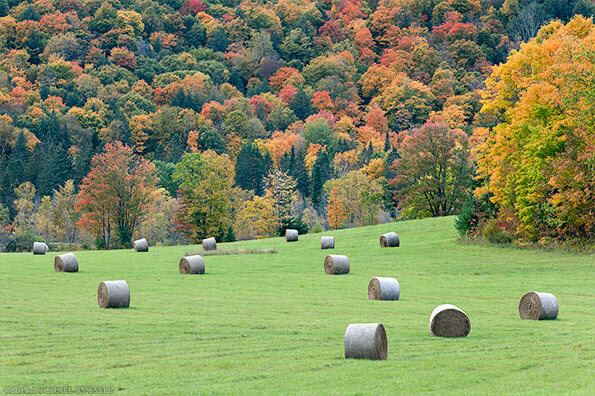 I may have been standing in the exact same spot for this photo as the one below with the hay bales and the fall colours on the Gatineau hills behind. 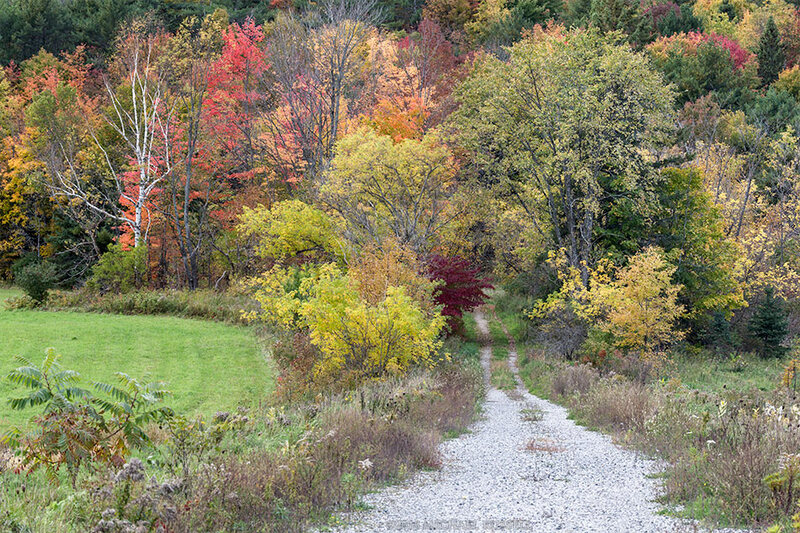 Either way, I think this photograph of the fall foliage and the gravel road disappearing into the forest – is one of my favourites of the whole trip. At least so far. The photo makes me want to walk through the trees and see what is around the corner. 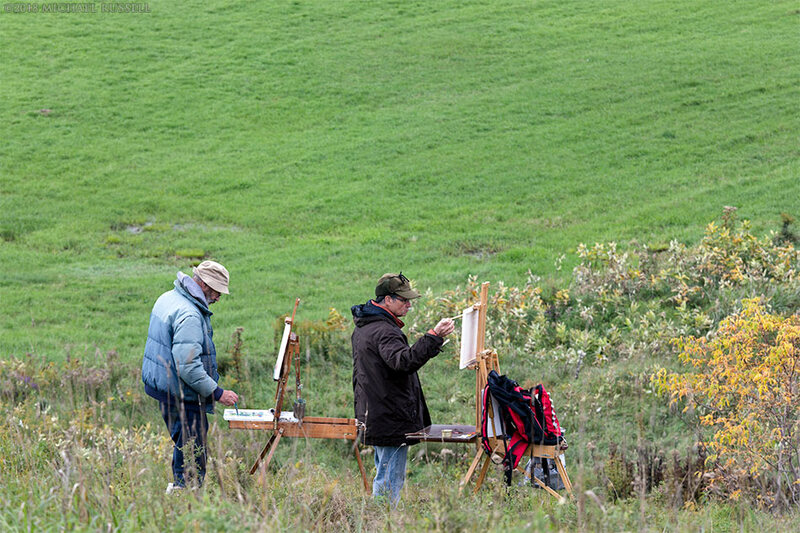 On a hill just above Meech Creek and the covered bridge I saw these two men painting the bridge. An internet search reveals a lot of paintings of this bridge and the surrounding fields, so this appears to be a popular spot for painting (and photography). I’ve also seen several drone videos from the area. When I was photographing the bridge and the scenes around it there was a man flying a drone over the bridge and fields. I don’t know if it is legal to do so there, but it certainly seemed to annoy the painters! Drones seem like a lot of fun to fly and photograph with – but they certainly destroy the ambience of a nice quiet place like this one. For more of my photographs from Quebec visit my Québec Photos Collection. Fall foliage color at the Beaver Pond during Fall Rhapsody Festival at Gatineau Park in Gatineau, Quebec, Canada. 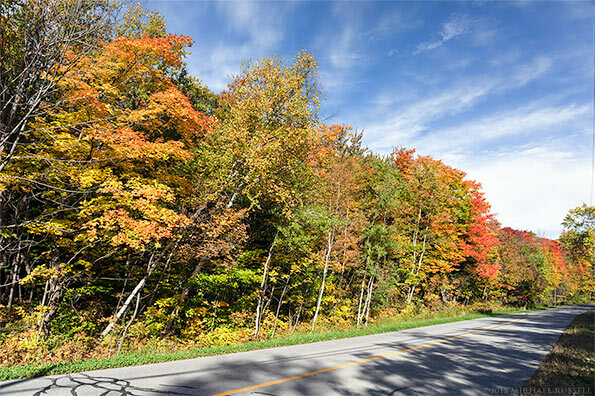 A few weeks ago I was in Ottawa, Ontario visiting family and we did a lot of driving around looking for fall foliage colors and other scenery. 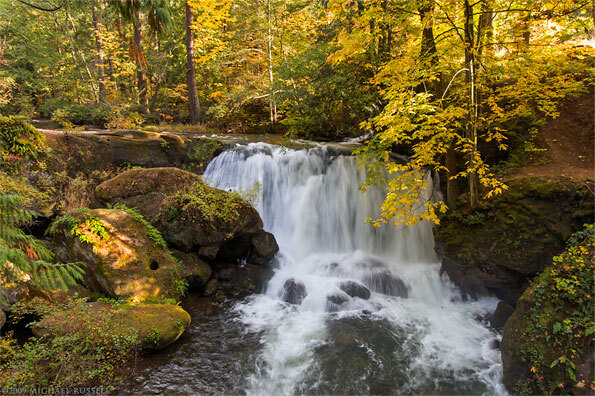 I was there a week before peak color, but I still saw a lot of foliage that was well beyond what I’d normally see even during a great fall color year in and around Vancouver. Much of the great color was in Gatineau Park, which is just across the Ottawa river in Quebec. I’d been following Gatineau Park happenings in social media for a few weeks, and while the peak of color was the following week, we also avoided all the closed roads and crowds! I have many photos yet to come from my trip to Ottawa, but I thought I’d start here with a few that show some of the best color I saw, but also from locations that don’t really merit their own blog post in the future. The first photograph here is from the “Beaver Pond” along the Gatineau Parkway. I couldn’t find a more official name for it, but the “Beaver Pond” is what most people seem to call it. 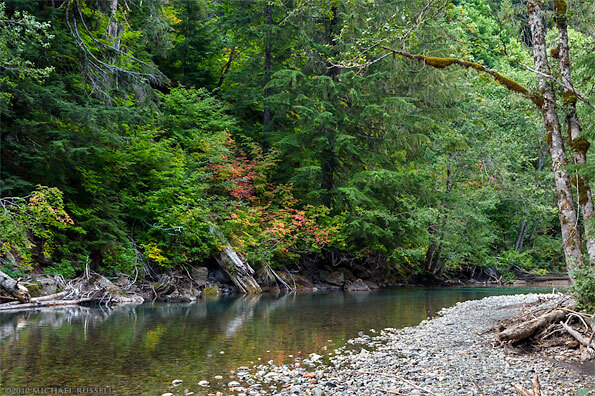 This photograph, and the wider angle of it, show some of the reds and oranges that we rarely get (from native species) here in British Columbia. The second photograph here was made at Lac Bourgeouis but from the side of the Champlain Parkway. I’d been to Lac Bourgeouis the day before, but these colors had improved a lot from the day before, and probably show the most interesting foliage I saw on the trip. Clearly the Maple leaves have not turned to the extent one would see at “peak” foliage color, but there are lot of reds and oranges, as well as yellow and the summer greens. I like that this photo shows the whole spectrum from summer to fall foliage. 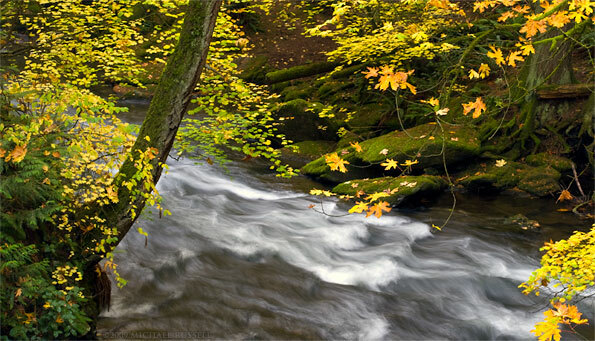 This panorama shows off the lighter colors of the maple tree trunks with their brighter foliage above. This is another unnamed marsh/pond in Gatineau Park, but is near the “Shilly Shally Shelter” and the junction of the Lac Fortune Parkway and the Champlain Parkway. I have several (to be published later) photos of this location that show a wider perspective but I think this one shows the most interesting elements of the scene. There are some smaller conifers in this area which further contrasts it from British Columbia where they would be the dominant type of tree in a mature forest. Sometimes a good patch of color is just along the side of the road! For more photos of fall foliage visit my Fall Photos Gallery.